Make brownie batter as directed on boxes for cakelike brownies. Measure out 1/2 cup batter; cover and refrigerate for later use. Spread remaining batter in bottom of pan. Bake 22 to 25 minutes or until toothpick inserted 2 inches from side of pan comes out clean. Cool 10 minutes. In large bowl, beat cream cheese with electric mixer on medium speed until smooth. Add sugar; beat until smooth. Add reserved 1/2 cup batter, 2 tablespoons whipping cream and the vanilla; beat until smooth. Add 2 eggs; beat just until blended. Spread evenly over cooled crust. Bake 26 to 30 minutes or until centre is set. Cool 30 minutes. In medium microwavable bowl, microwave chocolate chips and 3/4 cup whipping cream uncovered on High 1 minute; stir. Microwave 30 seconds; stir until smooth. Spread mixture on top of cheesecake layer. Refrigerate about 4 hours or until cooled completely. Cut into 6 rows by 4 rows. 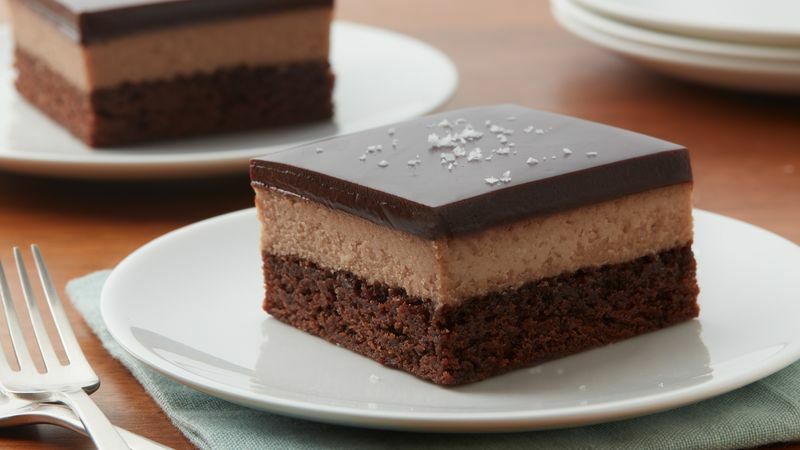 Sprinkle sea salt on top of chocolate layer before serving, if desired. Get creative with your topping! Sprinkle with chopped candy, or top with shaved chocolate for extra indulgence.